I’m here to spice up your cooking for the holidays with a few words about Recado. Let me tell you that we Belizeans have a love affair with recado, it’s true!! Anywhere we live in the world you could find us chugging this special spice in our suitcases. No Belizean kitchen is complete without this spice that’s known in Mexico or Latin America as Achiote. We love Recado for the slightly sweet and peppery flavors and the vibrant red color it gives to our stew chicken, beef, soups and sauces. 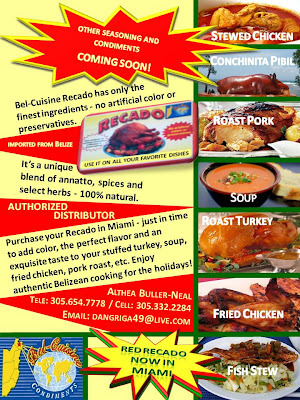 Recado is made from the seeds of the Annatto or Achiote fruit that’s grown in the Caribbean and Central America. The Annato bush has heart-shaped leaves and attractive pink flowers and is sometimes used in Belize as a hedge plant. The fruit is also heart shaped with red prickly spines. 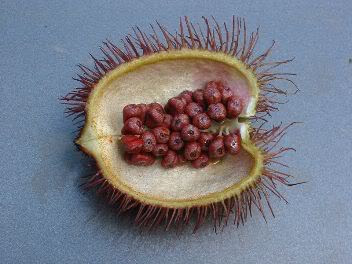 When ripened, the pod splits open to reveal about thirty to forty bright red triangular seeds covered with a red pulp. The seeds are collected and soaked in water. They can also be added directly to a cooking liquid or infused in hot water until the desired color is obtained for your soups or stocks. 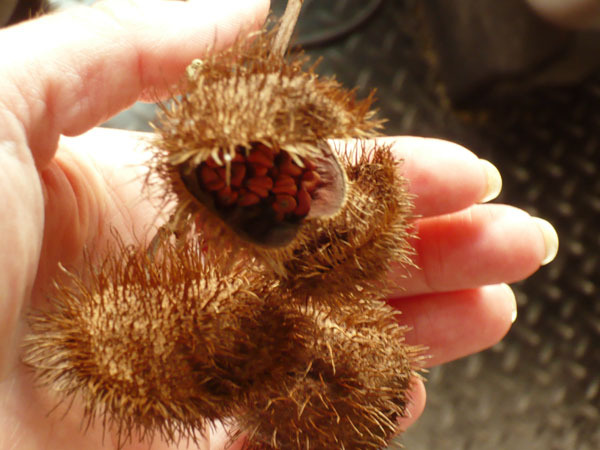 The Annatto seeds can also be fried in oil for a few minutes, after which they are then discarded and the oil is used for cooking. Be sure to cover the pan as the hot oil can cause the seeds to jump. The seeds can be purchased whole or available in blocks or paste in Belize, in the Caribbean or Latin American countries. When storing the seeds Recado, it should be kept out of light in an air tight jar or container. In Europe and North America it is used to color confectionery, butter, smoked fish and cheeses like Cheshire, Leicester, Edam and Muenster. As an effective natural colouring it is also used in cosmetics and textile manufacturing. This spiny red fruit of the Annatto bush were once used by the Mayans of Central America and indigenous peoples of South America for fevers, dysentery, and kidney diseases; the bright dye was also used as war paint and protection from insects. 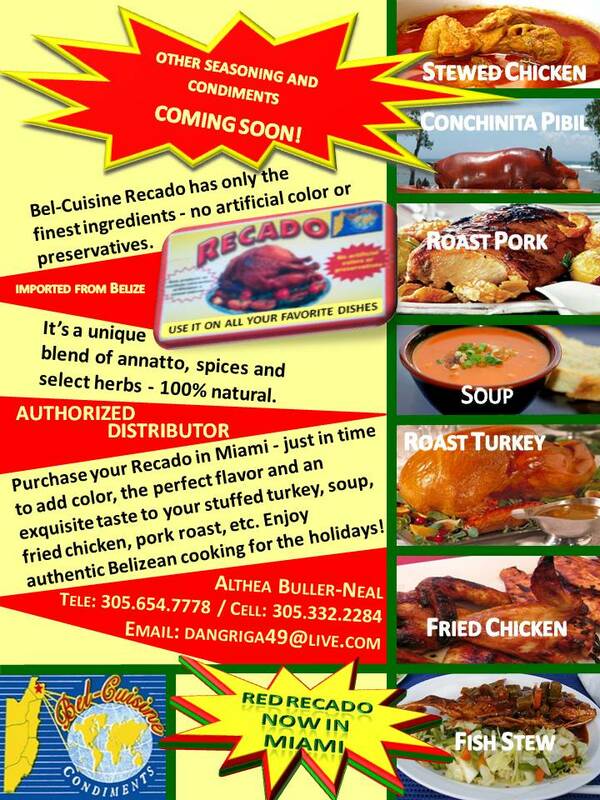 Where to buy Recado: Althea Buller Neal (H)305-654-7778 or (c) 305-332-2284. And remember, good Recado is red like blood!! You know it Linda, can't hardly cook without my recado. Always dodging someone coming from Belize to bring me some. Linda, thank you very much for this information. This is a real surprise to me, I didn't know the true origin of recado. Wow......I was born in Belize and didn't know that! (-: All these years I assumed that recado was made from corn and red coloring. You are never too old to learn! ‎"Anywhere we live in the world you could find us chugging this special spice in our suitcases." So true! Very informative, I see labels that say Achiote all the time and never knew that was Recado. From now on I'm buying more Achiote instead of Paprika. Lol. For anyone wanting to make belizean coleslaw u have to use the "heinz salad dressing" very hard to find in the united states but i found they carry it at Cost Plus or World Market .or at cost plus online.